Join us for a combination of lecture, demonstration, and workshop on the unique qualities and techniques of Asian brush painting, or “Sumi-e,” as it is called in Japan. We will explore some of the history and philosophy that has laid a foundation for this practice, as well as the traditional materials and approaches that are still used today. An introduction to the concepts and strokes of the “Four Nobles” (“FourGentlemen”) of Asian brush painting will be combined with the explanation of the focus and breathing practices that support the meditative nature of this “in-the-moment” creative practice. 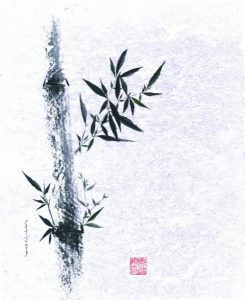 Materials will be provided for some attendees who would like to try their hands at the most basic strokes of the Bamboo stalk and leaf..
Edith A. Tonelli, Ph.D., (Tang DiAn, in Chinese) is owner of TonelliArts Gallery and Tonelli Coaching and Consulting. 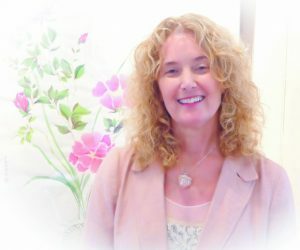 She is the Guest Curator for the Heritage Museums and Gardens’ 50th-anniversary exhibition, and is the former Director of the Cape Cod Museum of Art in Dennis, Massachusetts, She has been a practicing Sumi-e artist and instructor for over 20 years, and traveled and studied Asian brush painting in Mainland China for several months in 2006. Her painting, Sumi-e Cape Cod, was selected for the Sumi-e Society of America’s Annual Juried Exhibition held in Washington, D.C. in 2014. Before moving to Cape Cod, she was Director of the UCLA Art Museum (now the Armand Hammer Museum at UCLA), an Assistant Professor of Art History, and Director of the Museum Studies Program for ten years. Dr. Tonelli received her B.A. in American Studies at Vassar College, an MFA at Hunter University, City University of New York, a Master’s degree in Clinical Psychology from Antioch University, and a Ph.D. from Boston University in American and New England Studies. Her most recent publication is Art from Cape Cod: Selections from the Cape Cod Museum of Art, a 300-page catalogue of highlights from the museum’s permanent collection.